Be the first to share your favorite memory, photo or story of James H.. This memorial page is dedicated for family, friends and future generations to celebrate the life of their loved one. 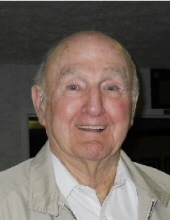 Mr. James H. “Jim” Callihan, age 90, of Olive Hill, Kentucky, passed away Wednesday morning, January 23, 2019, at his residence. He was born June 20, 1928, in Carter County, Kentucky, a son of the late John and Ora Brammer Callihan. Jim proudly served his country in the United States Army. He was a member of the Olive Hill United Methodist Church and the Olive Hill Masonic Lodge #629. Jim was well known in his community, where he never met a stranger and always had a story to tell. He enjoyed gardening, driving and spending time with his children, especially with his grandchildren. In addition to his parents, he was preceded in death by his wife of 59 years, Ida Carroll Callihan; one son, James “Jim Ray” Callihan; ten brothers, Curry Callihan, Delbert Callihan, Dickie Callihan, Gomer Callihan, Bethel Callihan, Tommy Callihan, Homer Callihan, Otha Callihan, Charles Callihan, and Archie Callihan; and five sisters, Annabelle Foxwell, Nannie Lawson, Marceline Callihan, Helen Dawkins, and Geraldine Callihan. Jim is survived by one son and daughter-in-law, Charlie and Dorothy Callihan of Lexington, Kentucky; three daughters and one son-in-law, Joyce and Gary Messer of Morehead, Kentucky, Connie Gardner of Olive Hill, Kentucky, and Brenda Fairchild of Fort Thomas, Kentucky; 14 grandchildren; 25 great grandchildren; and one sister, Peno Knipp of Dayton, Ohio. He also leaves many other family members and friends who will sadly miss him. Funeral services will be held at 1 p.m. Sunday, January 27, 2019, at Globe Funeral Chapel in Olive Hill, Kentucky, with Brother John Lambert and Brother Terry Dean officiating. Entombment will follow in the Dean Cemetery in Olive Hill, Kentucky. Friends may visit from 6 p.m. to 8 p.m. Saturday, January 26, 2019, and after 9 a.m. on Sunday at Globe Funeral Chapel, 17277 West Highway US 60, Olive Hill, Kentucky 41164. Andrew Callihan, James Gardner, Christopher Adkins, Tripp Holbrook, Drew Holbrook, and Allen Holbrook will serve as pallbearers. "Email Address" would like to share the life celebration of James H. "Jim" Callihan. Click on the "link" to go to share a favorite memory or leave a condolence message for the family.